You are at:Home»Herbs»Phoenix dactylifera Linn. Latin name : Phoenix dactylifera Linn. Description : The sugar content of ripe dates is about 80%, the remainder consists of protein, fat and mineral products including copper, sulphur, iron, vitamins A, B and D, magnesium and fluoric acid. Dates are high in fibre and an excellent source of potassium. Dates are considered cooling, demulcent, expectorant, laxative, nourishing, very nutritious, spermatogenic and tonic and are used in respiratory diseases like asthma, bronchitis, tuberculosis, cough, fever and low vitality. Dates are also regarded as antianaemic, antioxidant, aphrodisiac, astringent, diuretic, emollient, estrogenic, pectoral, refrigerant and sweet. Useful in anaemia, catarrh, weakness of eyesight, fatigue, sterility, stomachache, thirst, urogenital ailments and vaginitis. 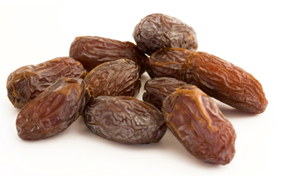 Dates are also reported to be used in cases of memory disturbances. They are effective for both diarrhoea and constipation due to malnutrition and atony of the bowels. Recommended Dosage : Dried Dates : 10 to 15 g powder; Fresh Dates : 10 to 15 g.
Contraindication : Dates have no known warnings or contraindications.